Tunisian wine? Such a thing exists? Across the spectrum of Tunisian food and drink, it was the quality, availability, and affordability of Tunisian wine that surprised most. How does it compare to other wines around the world? Those of you familiar with the Arab and Muslim worlds may expect alcohol to be difficult, or at least, expensive – though not impossible – to come by. That is not the case in Tunisia. While many restaurants do not serve alcohol, many do so. Imported wine, beer, and spirits are a bit more difficult and much more expensive (marked up), but Tunisian beer and wine are widely available. The French and Italian influence on Tunisian winemaking is evident, though I’m sure the French and Italian contingent may beg to differ. I was surprised pleasantly with the drinkability and variety of Tunisian wines. In Tunis, local Carthaginian wine Magon – and its several gradations (Premier, Vieux, etc. – in vin rouge, blanc, and rose blends) is plentiful and cheap, typically costing less than 11 dinar per 750 mL bottle at supermarkets like Carrefour and between 35 and 40 dinar per bottle at restaurants. Magon is a clean and simple wine, and it probably least resembled French wines with perhaps a nod to an Italian Sangiovese. It is smooth, with balanced acidity and low tannins, and nonexistent oak. Other red varieties also seemed low in oak and tannins but with higher acidity. Still, they were smooth and inoffensive – that may not sound like a ringing endorsement, but they were far superior to any similarly priced wines in the US and on par with many European imports. I must rave about one wine though. 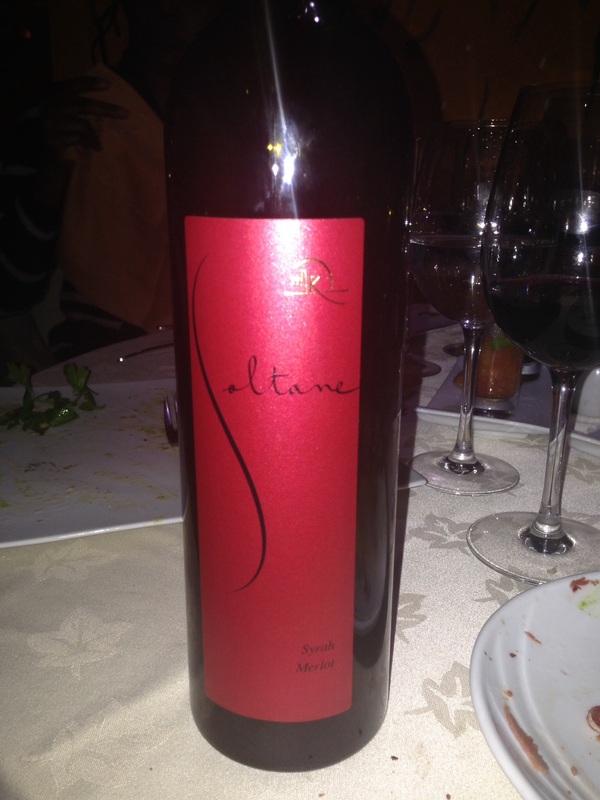 The Soltane de kurubis Mornag red, a Syrah-Merlot blend, was head and shoulders above the average Tunisian wine. Why? Though more subtle than the often heavy oak of some French wines, such as chateauneuf de pape or the robust, “big” red of a right-bank Bordeaux, it had more complexity and richness than other Tunisian reds. It played more like an old world red, but with the dark cherry and currant aromas of a California merlot. Despite the inclusion of the syrah grape, it was not peppery, and its tannins were smooth and subtle. I don’t know if I was starved for that complexity after a few weeks of Magon and others, but I couldn’t get enough of the Soltane, which was unfortunate given that I could only find it at restaurants and not for retail sale. Sigh. The one souvenir besides leather handbags I really wanted, but it was not to be! For white, the heavy Muscat varietal is readily available, but it most often is not a late harvest (dessert wine), so if you are accustomed to the peachy sweetness of a Muscat or Muscato dessert wine, you will be a bit surprised to find it more like a heavier, buttery Chardonnay. All in all, if you happen to stumble upon a Tunisian wine, don’t refuse it! You may find yourself enjoying it more than you thought possible.